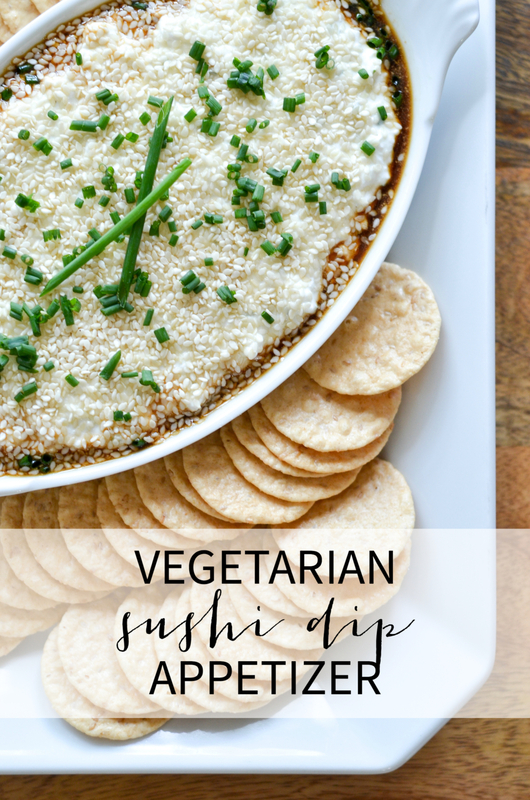 I picked up the idea for this vegetarian sushi dip appetizer from a friend who made something similar recently and it is so easy and so yummy. It has all the flavors you love from sushi but requires none of the effort or special tools it takes to actually make sushi at home. My daughters are often my taste testers and especially in summer when they’re home with me a lot they hover nearby while I’m taking food photos waiting for the signal that they can dive in and eat what I’ve been photographing. I finished taking these photos, told them they could eat the sushi dip, and by the time I came back into the kitchen from uploading the photos onto my computer they had eaten half the bowl! So I’d say this got their enthusiastic vote of approval. The base of this sushi dip is Hood Cottage Cheese with Chive, which I recently used in this caprese stuffed endive recipe as well. 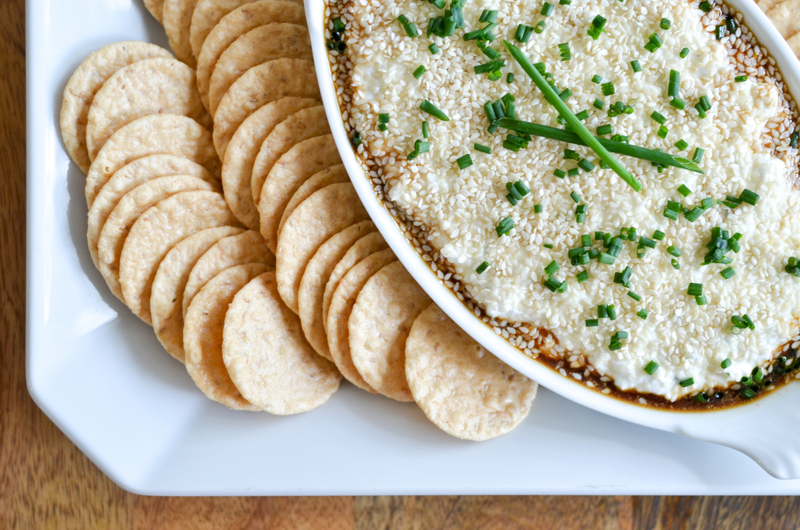 I love using Hood Cottage Cheese in snacks and appetizers because of its light flavor and high protein content. 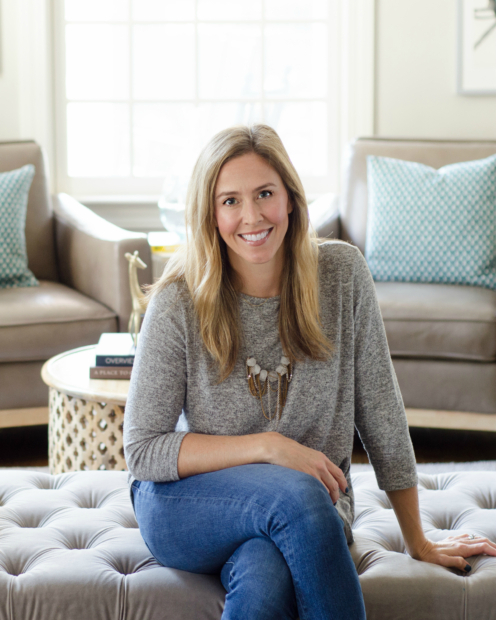 I’ve talked about my quest for more protein before, but in a nutshell, the more protein I can get into my diet and my daughters’ diets, the better! It helps them stay full longer and it’s so important for muscle growth for both them and for me. Hood Cottage Cheese comes in ten different sweet and savory flavors, which makes it perfect for adding rich flavor to everything from breakfast to snacks to appetizers, and makes it so easy to get extra protein into your diet (around 10g of protein per serving). If you’re new to eating cottage cheese I have some breakfast and snack ideas here and a super delicious recipe for a cottage cheese parfait with spiced applesauce here. 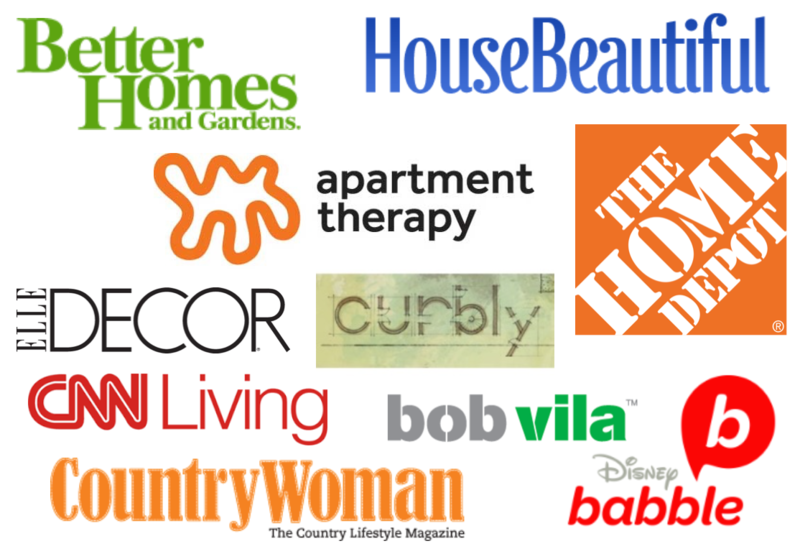 You can find a store locator to see where Hood Cottage Cheese is carried near you HERE. I kept things pretty simple for this sushi dip recipe but you could also add some chopped dried seaweed into the mix and serve pickled ginger on the side to up the sushi flavor even more. With the wasabi powder, you should add as much or as little as you like. I wanted it to be on the milder side since my daughters were going to be eating it but if you love a little more wasabi kick, just stir it in to taste! I like this wasabi powder because it doesn’t have any color additives (a lot of them have yellow and green color added). It’s amazing how much the combination of wasabi, sesame, and soy sauce makes you feel like you’re eating sushi, but with the convenience of an easy dip that you can put together in minutes. 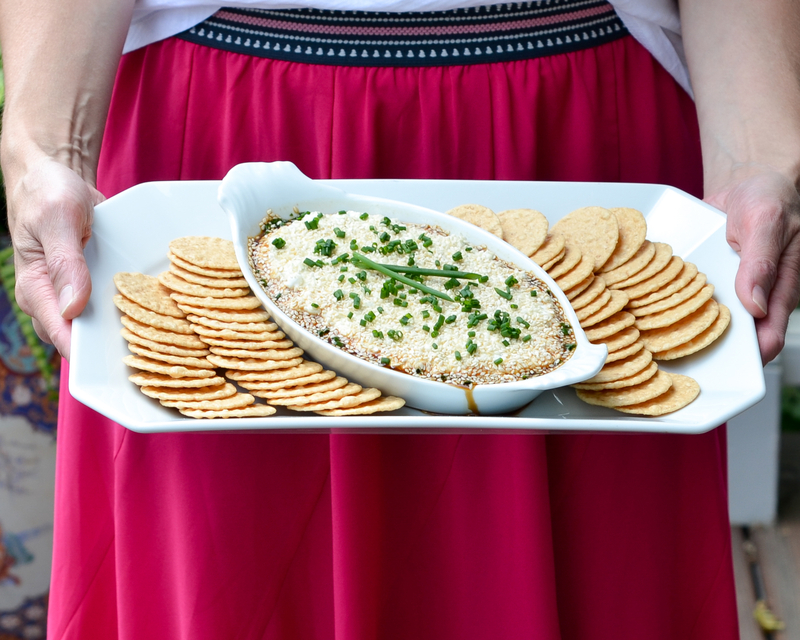 This sushi dip appetizer is perfect for any time of year and any occasion and it looks so pretty with its sesame seed crown, dusted with fresh chopped chives. A pretty appetizer that tastes great and can be made in minutes…well, who doesn’t need more of those in their back pocket?? 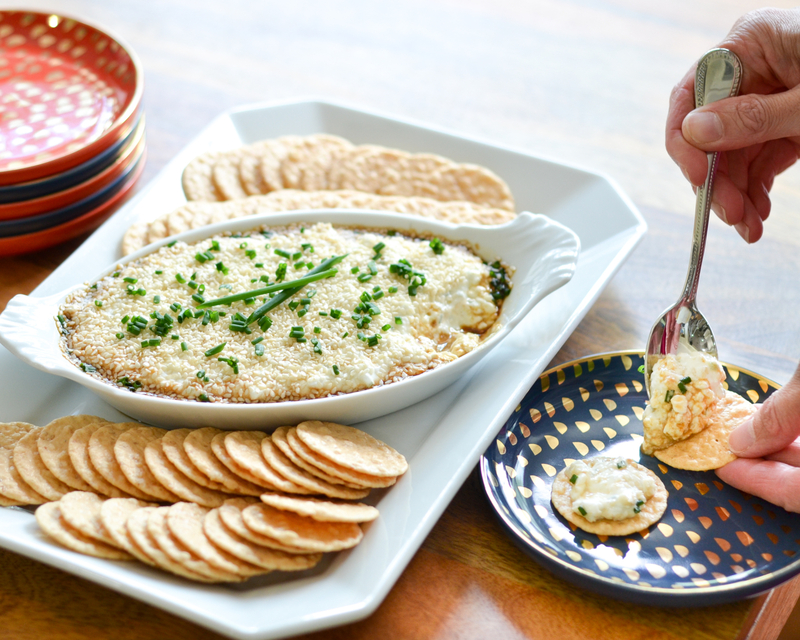 Tuck this one away for the next time you need to throw a quick appetizer together – this is one of those easy apps I know I’ll go back to again and again. An easy vegetarian sushi dip appetizer with a high-protein cottage cheese base. All the flavor of sushi with none of the work! 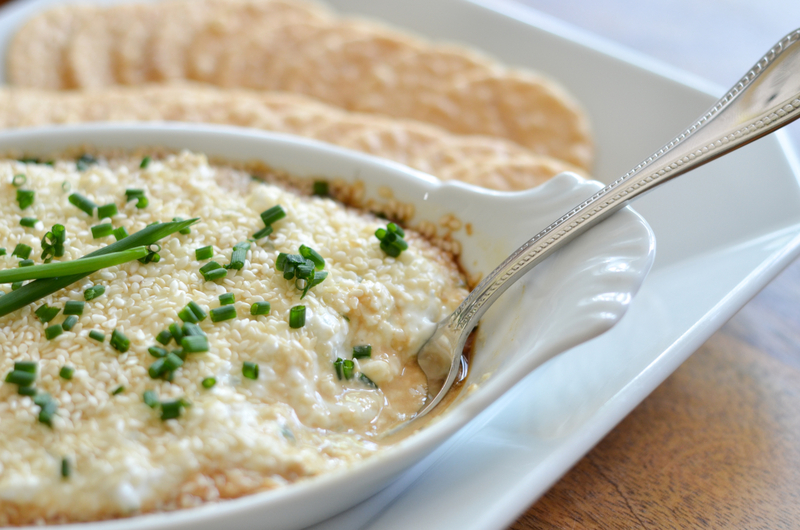 Spread ½ c. Hood Cottage Cheese with Chive across the bottom of a shallow bowl or dish. In a separate bowl stir together another ½ c. of Hood Cottage Cheese and 1 tsp. of wasabi powder. Add more wasabi powder if you like more heat. Spread the wasabi cottage cheese on top of the bottom layer in the shallow bowl. Spread the remaining ½ c. of Hood Cottage Cheese on top of the wasabi and Hood Cottage Cheese mixture. 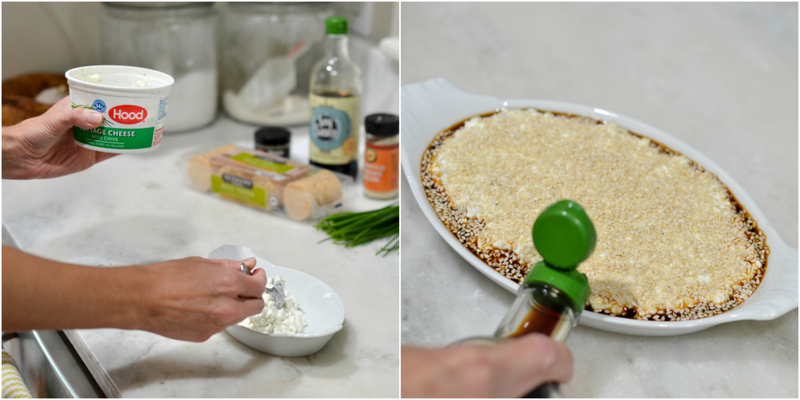 Sprinkle the top with the sesame seeds then carefully drizzle soy sauce around the outer edges of the dip. Top with chopped fresh chives and serve with sesame rice crackers and pickled ginger (optional).